Exploding Doughnut: Blue. Socks. Bed. My aunt was released from the hospital on Christmas Eve. She completed her physical therapy and got the okay to spend the holidays with family. When we got her home, however, she was still quite weak and her mobility limited. She had trouble walking up steps, standing up from a chair, and even getting off the couch. The realization she'd need assistance with the simplest of things--her independence compromised--was too much. My aunt broke down and started crying. "I feel like such a failure," she said. I stayed with her for the next several days in case she felt unsteady or needed help getting around the house. I reminded her that she just had surgery (a hysterectomy) less than two weeks prior and it will take time to get back to the way she was. "You're only a failure if you stop trying," I told her. Each day she became a bit stronger and more mobile. She stood from the kitchen chair, was able to get up from the couch, and I even had her walk outside to the backyard each day to practice going up and down the steps. Little victories that added up. When she was first admitted into the Physical Therapy wing (before being sent home), the nurse asked my aunt what her goal was. "To be able to do things on my own. To be be independent." 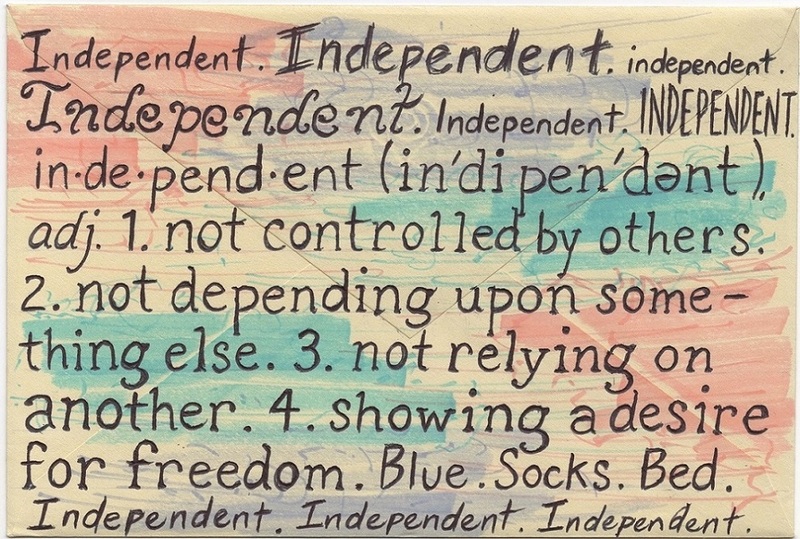 Markers and ink on standard mailing envelope - 5" x 7"
What better message to send than the word "independent". To test her cognitive skills, the nurse gave my aunt three words to remember and then was asked what they were several minutes later. "Blue. Socks. Bed." I snuck those in on the envelope as well. When I last saw my aunt (a couple weeks ago), she seemed in better spirits, had her old personality back, and appeared much stronger. "You look like how you were before the surgery," I told her. Recovering from the surgery is just the first step though. Next will come treatment in the weeks ahead for the remaining cancer but I know my aunt can handle it. I'm rooting for you, Auntie!! So good to hear about your Aunt's improved health. What a helpful nephew you are, what a blessing you were/are to her. 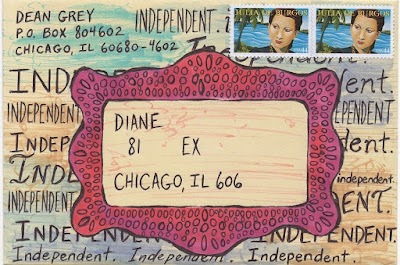 It must have lightened her spirit a lot to receive your amazing mail art. Take good care my friend. God bless. Thanks for sharing the card to your aunt. I wish her the best in her battle to regain her health. I remember the dark days when you helped your uncle. Please remind your aunt, that it takes at least 2x in time to work back to normal. If she was in the hospital for a month....it will take two months of hard work to regain strength. I have an extremely pessimestic view of medicine today. Sometimes I think people receive complex surgery because their insurance will pay for it. A Hysterectomy is radical surgery and reworking of the pipes for any age. Her spirit is most important. You are doing great keeping her in the "I'm getting better camp!" The kind words are always appreciated, dear Stan! 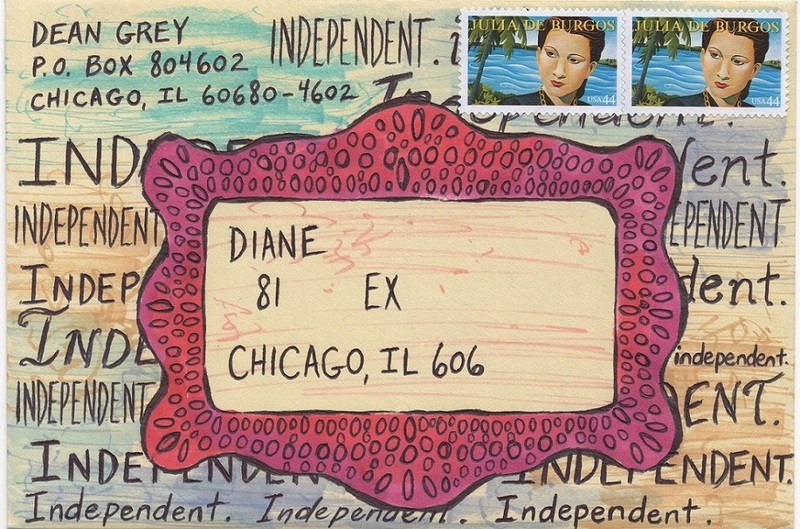 I'm glad I could share the Mail Art with all of you. My aunt's surgery was definitely major but necessary. Little by little she regains her strength and her old self back. Ha, I really haven't created Mail Art in a LONG time. Hopefully the piece sent to my aunt is just the first of many more new pieces to come. Thanks to all three of you gentlemen for commenting here!